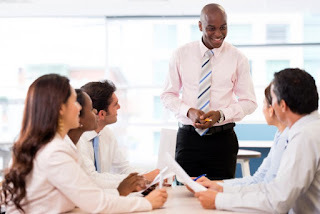 Home » Business » Business plans » How do I learn to be a better leader in the workplace? How do I learn to be a better leader in the workplace? Not sure where your personal leaderships skills are at? Getting a professional psychometric assessment or other examination can provide an objective look at your abilities. Though text may not be the most engaging way to learn new inter-personal skills, a good book can be your first step in developing new leadership abilities. One great feature about gleaning information from a book is that you can do so at your leisure, and refer back to it later. Carry a good leadership book with you, and take advantage of all those wait times that crop up during the day (like during your subway commute each day perhaps?). This is ideal for the busy business-person who can't carve too much time out of their schedule for more demanding approaches. If you have the time to attend, these types of presentations are more stimulating that just reading a book and can more clearly demonstrate the qualities you want to learn. With online video streaming, you can more easily take advantage of workshops without physically having to attend. That should open up plenty of options for you. When it comes to leadership and related topics, most of your options are likely going to be in the form of single seminars/presentations or workshops that might last a day or two. Longer classes that go on for weeks can be very insightful if you have access to them, and have the time to commit to a longer bout of education. Check with local business colleges to see what they have to offer as well. Great information doesn't necessarily have to come from a corporate or professional organization. Are there any leaders in your work environment that you would like to emulate? See about sitting in on meetings or even just spend some time in their offices to see how things are done in a real-time situation. If you have any personal contact, even set up a short meeting for a little one-on-one questions to get their ideas on leadership. For great leaders that you can't personally approach, find video examples of their work or speeches for inspiration. If you are inspired by more historical leaders who don't seem to have a presence on YouTube, you can learn a lot about their style through biographies or other books on their lives. For those who aren't currently in a leadership role, this won't help all that much. But if you are, your own people can be an amazing help to point you in the right direction for improving your approach. Talk to your team or staff, and see what they think about your leadership. Granted, your own people may be a little reluctant to say anything that might sound like a complaint so be prepared to read between the lines a little. This sort of open communication can let you know what you might need to change, and actually is one way to improve your skills in itself. Honest communication is a corner-stone to being a fantastic leader.